Among all plants that can produce sugar, people are most familiar with sugar canes and sugar beet; however, Palmyra palm of the palm family actually is also good at producing sugar. Palmyra palm grows in tropical Asia and Africa. It is very tall and its feather-like leaves are big and dense, which can block the scorching heat of the tropical sun like a natural canopy Palmyra, and provide people with cool shades like huge green umbrellas. 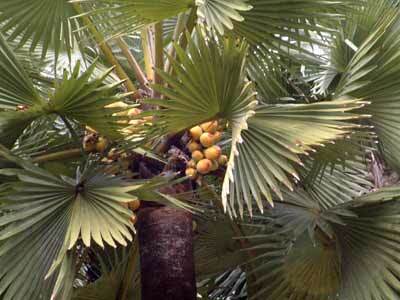 Palmyra palm can produce many fruits; usually dozens of fruits gather at the neck of the tree. All the fruits are very beautiful and as big as balls, and are golden bright. If they are picked up and placed indoor, they become a piece of natural craftwork admired by many people. In Southeast Asian countries, people like to plant some Palmyra palm trees before or behind their houses or plant a piece of Palmyra palm trees as the source of their sugar. Each Palmyra palm tree can produce over 10 or dozens of large anthotaxies that have sugar contents. When the anthotaxies grow out, the collectors will climb to top of the tree and put a bamboo can or a small water can on the tip of the anthotaxy. They cut an opening in the anthotaxy, and the sugar water will flow into the cans. One anthotaxy can produce 3 to 4 cans of sugar liquid, and each palm plant can produce as many as 60 to 70 buckets of sugar liquid, which can be made into 20 to 30 kilograms of solid sugar. If a family with three people plants one Palmyra palm, they need have no worry about their sugar. Palmyra palms are divided into male and female ones, and only the female one can produce sugar.